Starting his airline career in 2005 with easyJet as Revenue Manager for the U.K. regions, he later held the position of Commercial Manager U.K. regions, managing a portfolio of over 150 routes, with over 40 aircraft and numerous commercial responsibilities across the U.K. ranging from pricing and revenue management, network development, PR, marketing and ultimately P&L. His last three years at easyJet, he undertook the Commercial Manager London role with responsibility for four London airports, Gatwick, Luton, Stansted and Southend (over 80 aircraft, 200 routes) driving P&L and market share. 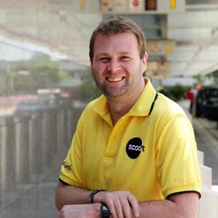 Trevor joined Scoot in Singapore as Senior Manager Planning in 2013 to build, lead and develop the team as the airline grew rapidly over the start-up phase. In April 2015, Trevor was promoted to his current role as head of sales and distribution, leading a team of 30. He is accountable for the development and implementation of Scoot’s sales & distribution strategies.